What is the Smallest Microwave Oven on the Market? Not everyone can have a huge kitchen. In fact, many people have to make do with very little space, especially in apartments. People may want all the latest kitchen appliances, but they can’t have them if there’s no space to put them. Microwave ovens are one of the most versatile appliances on the market. From reheating leftovers to cooking from scratch, they can even be used in place of a full-sized oven. Many also want their microwave to take up as little space as possible because they only use it for a few basic tasks. 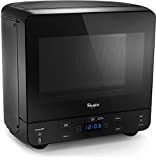 Anyone who is low on space in their kitchen could benefit from looking for a small microwave oven. In fact, they might even want to buy the smallest microwave on the market. What Do Buyers Want From The Smallest Microwave? Quite simply they want everything that a standard microwave offers. A smaller unit shouldn’t mean having to do without all the functionality and presets of a larger model. Yes it needs to be small but with enough interior space to put a dinner plate in and powerful enough that it saves time over a conventional convection oven. If it can satisfy this then you have a worthy product. But what is the smallest microwave oven you can buy? The Whirlpool WMC20005YB 0.5 Cu ft microwave oven is just 17 x 17.15 x 17.5 inches. It weighs only 32.6 pounds, making it easier to move around the kitchen or transport when moving home. It’s ideal for anyone who has limited space in their kitchen or kitchenette. It will sit right on the countertop without taking up much room. Its choice of colors gives options to match anyone’s kitchen decor. The microwave also has a cord of approximately 33 inches in length. This generous length means it can be plugged in at the most convenient power outlet. The model is available in a black, white or stainless steel look. The choice of colors is a bonus, although some say that some colors look cheaper than others. With its 750-watt cooking power and ten power levels, this smallest microwave is ideal for a range of jobs. The tap touch controls make it simple to add 30 seconds to the timer or put some popcorn on with just one touch. Pressing the start button automatically adds 30 seconds to the timer. When it has finished its job, the microwave beeps three times so that it catches your attention but isn’t intrusive. If you forget about your food, it beeps again to remind you. The interior of this smallest microwave oven is large enough to take a regular dinner plate. Although it won’t hold taller items, such as tall coffee mugs, it is adequate for many other things. The blue clock on the microwave is bright, which might be a bonus for some but a drawback for others. The microwave itself runs quietly, although the buttons do make noise whenever pressed. This basic microwave keeps things minimal. It sticks to a timer and popcorn button rather than having further features. It May Be The Smallest Microwave Oven But Is It Any Good? 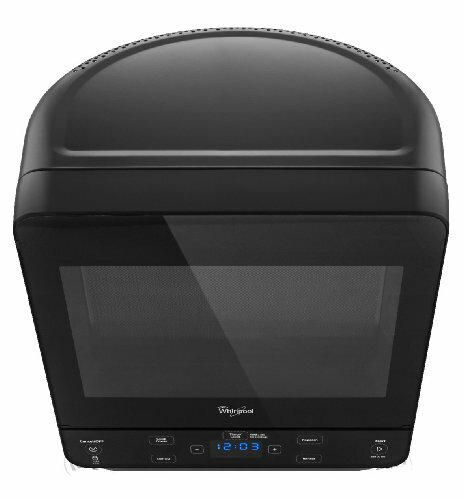 Anyone looking for a small, compact microwave will be happy with this model from Whirlpool. However, it is important not to expect too much from a microwave designed to save space. It can perform many everyday tasks. But potential buyers should recognize that a small microwave means compromising on power and some functionality. This 750-watt microwave is suitable for a range of purposes but won’t deliver the power of a larger oven. Some other features might be inconvenient for some, such as the 30-second timer increments. However, to others, these things aren’t important. The small design is perfect for anyone low on space, and it looks stylish too. Although the interior space is limited, there is still room to put in standard items. The touch buttons make it easy to get the microwave going quickly, and the popcorn button is useful, just pop in a bag of popcorn or a small popcorn popper. It doesn’t offer the full functionality of a larger microwave, but that’s unnecessary for many people. Anyone who only uses their microwave on occasion and doesn’t need it for heavy-duty tasks will find this Whirlpool model ideal. Just remember that it is best for light duties. Couples and single people may love it, but families will prefer something larger and more powerful if they have the room. Yes this is the smallest microwave on the market but the last thing we’ll say is that the convenience of such a small product does come at a cost. There are other slightly larger products available at lower prices. But if you think this is the model for you click the link below to check the latest price.